Amidst the post Katrina finger pointing, some critics are looking at how the loss of Gulf Coast wetlands and barrier islands contributed to the devastating impact of the recent hurricane. Experts point out that the loss of the buffer zones provided by wetlands along the Louisiana coastline basically created a runway for Hurricane Katrina to land with full force in New Orleans. The ability of wetlands to control erosion is valuable because in coastal areas they protect the mainland from the storm surges from hurricanes and tropical storms. 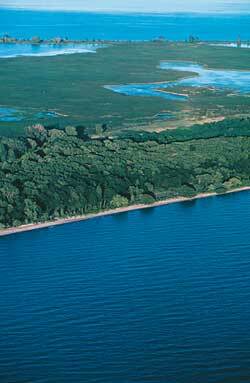 Wetlands at the margins of lakes, rivers, bays, and the ocean shield shorelines and stream banks against erosion. Additionally, wetland plants hold the soil in place with their roots, absorb the energy of waves, and break up the flow of stream or river currents. The residents and elected officials of the Gulf Coast have been concerned about the problem of coastal erosion for quite some time. Past attempts to obtain federal funding to alleviate the problem of coastal erosion, however, have been controversial because of the big price tag involved. In the mid-1990s, Louisiana?s congressional delegation started pushing for the restoration of the region?s wetlands. Yet, the legislators did not succeed in persuading the other members of the U.S. Congress to provide funding to deal with this problem -- other than a small annual appropriation called the Breaux Amendment named for the recently retired Sen. John Breaux (D-La.). Finally, this year after lots of political wrangling, a bill emerged from Congress that provided Louisiana with $540 million for coastal restoration over the next four years. Proponents of coastal restoration argue that this amount is woefully lacking. For example, Mike Tidwell, the author of the prescient book Bayou Farewell: The Rich Life and Tragic Death of Louisiana?s Cajun Coast (2003, Pantheon) estimates the cost of rebuilding Gulf Coast wetlands and barrier islands to be approximately $14 billion. To put this in perspective, Tidwell points out that $14 billion is about the cost of the "Big Dig" road improvement project in Boston or about two weeks? worth of U.S. funding to carry out operations in Iraq. He argues that no repairs should be carried out in New Orleans ("not one window fixed") until the fundamental problem of coastal erosion is first addressed. As he points out in his book, "The whole ragged sole of the Louisiana boot?is literally washing out to sea" and New Orleans will continue to be an endangered city until this problem is corrected.